What Are Pork Riblets and Rib Tips? Restaurateurs, butchers, and grocery store owners capitalize on the popularity of ribs when they sell pork riblets and rib tips. Riblets are simply smaller pieces cut from a full rack while rib tips are meaty chunks from the underside of spare ribs that contain cartilage but no bone. Both are inexpensive, easy to cook, and the perfect appetizer for a backyard barbecue. Like full ribs, these little morsels benefit from low and slow cooking on the grill or in a smoker. The names often get applied interchangeably, but these butcher "scraps" actually come from different parts of the rib. When a rack is trimmed to make St. Louis-style ribs, a boneless strip of meaty rib ends (or tips) remains. Riblets are produced when butchers cut the rounded end off a slab of rib bones to even it out for better presentation and easier cooking. But the distinction doesn't really matter; you can use rib tips and riblets interchangeably as well. Remember that riblets and rib tips are still ribs. Low and slow cooking produces the most succulent results. An indirect gas grill fire for an hour or two or a smoldering charcoal fire turns these butcher scraps into tasty little treats. Apply a favorite rub or just sprinkle them with some seasoning; they need little in the way of prep. If you want barbecue sauce, brush it on at the end of the cooking time to prevent burning. Smoked rib tips make a great appetizer while other things continue to smoke. Throw rib tips on the smoker a couple of hours before your guests arrive. Treat them as you would a rack of ribs; you can pull them off the smoker and serve them while your guests settle in and get their drinks. This keeps everyone busy and happy while you finish the main course. What Do Pork Riblets and Rib Tips Taste Like? Riblets and rib tips taste like pork ribs; this milder meat readily assumes the flavor of whatever seasoning you choose to use with it. Similarly, they adapt to many cuisines and can be prepared with a dry rub or a wet sauce, or a combination of the two. Both make satisfyingly messy finger foods. Consider serving pork riblets instead of chicken wings at a game-day party or backyard barbecue. You can put any pork rib recipe to use when you prepare riblets and rip tips. Just keep in mind that the boneless rib tips and smaller riblets cook faster than a full rack, making them a good choice for an appetizer. In the past, these small pieces often got tossed or ground into sausage. Now you can buy them packaged at many grocery stores. If you can't find them, ask at a specialty butcher shop. You may see boneless tips labeled as riblets, but they cook similarly, so there's no real need to make a distinction. You can also pick up a rack of baby back or spare ribs and ask your butcher to cut it in half lengthwise for you to create riblets. You can keep fresh pork riblets and rib tips in the store packaging in the coldest part of your refrigerator for up to three days. For longer storage, freeze them tightly wrapped in plastic or special freezer paper for up to three months. 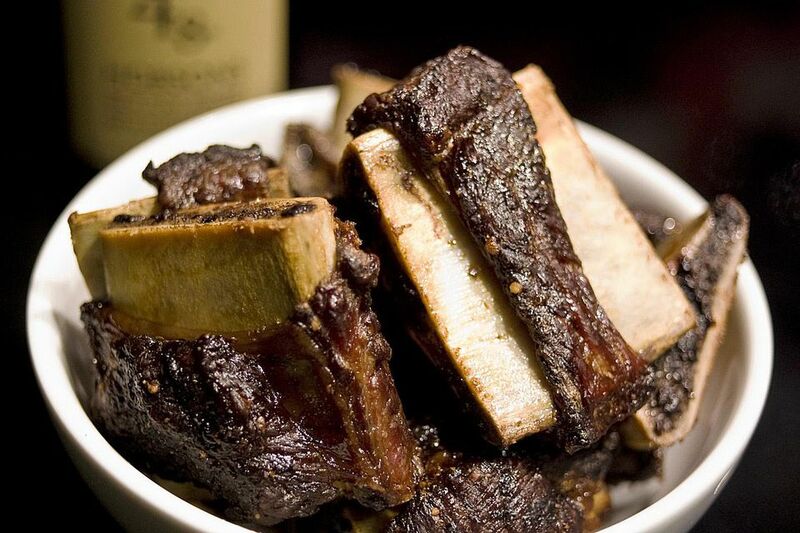 Leftover cooked riblets and tips should be refrigerated within two hours in an airtight container and eaten within a couple of days. The nutritional profile of riblets and rib tips generally matches that of the baby back or spare ribs that preceded them. The fattier spare ribs contain about 330 calories in a 3-ounce serving, with 25 grams of fat, 24 grams of protein, and 34 percent of daily allowance for cholesterol. The slightly leaner baby back ribs contain 280 calories, 21 grams of fat, 20 grams of protein, and 26 percent of daily allowance for cholesterol.